The moment you walk into Photography by Corinna, you will know you came to the right place. 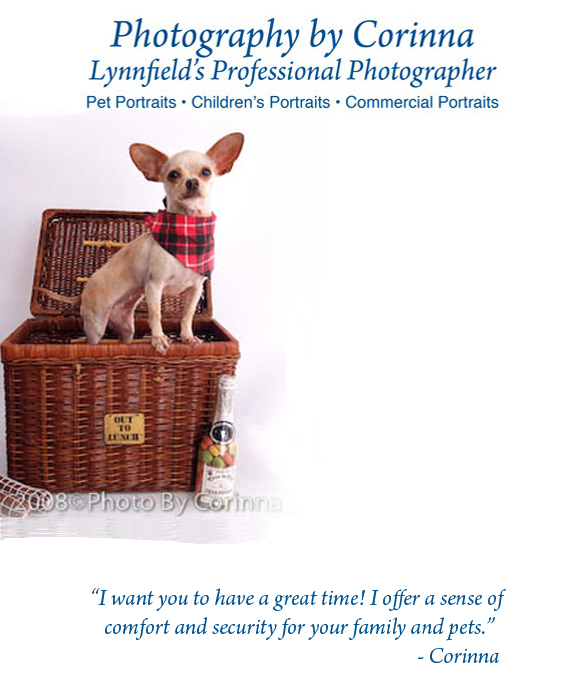 Corinna specializes in pet photography and children's portraits, right in her cozy Lynnfield, MA studio.Your children will feel comfortable and your pets will be drawn to the all the toys! And you never know which of Corinna's many pets will be there to greet you! You'll find Corinna to be enthusiastic, patient and easy to work with, with an eye for detail and a willingness to go the distance for the perfect shot! She understands photographing your children is effortless when they are in a familiar setting and capturing that perfect pet portrait might be in your backyard or at the beach, so in addition to the studio, Corinna will gladly shoot your choice of location. Photography by Corinna uses high quality digital equipment and is constantly upgrading as technology advances. Her extensive Photoshop expertise helps with any post production. Corinna offers other design services. Click on the EXTRAS link to find out more.